Many people travel during the summer, whether on vacation or for work. One of the most difficult habits to maintain during these trips is exercise. Traveling can really disrupt your daily routine and your sleep schedule, which can make staying active seem like a chore. However, it is important to continue an exercise routine in order to stay healthy. Even a scaled down version of your traditional regimen may help you maintain during time away. Below are some tips for continuing an active lifestyle while you're on the road. Those who travel lightly will be happy to know that there are many exercises which require almost no equipment. The most obvious forms of aerobic exercise include walking and/or running. Walking up and down stairs is another great aerobic option when a staircase is available, near your hotel or even in the hotel itself. Body weight exercises are a great option for continuing a resistance exercise routine while traveling. Examples of these include; push-ups, sit-ups, lunges, and squats. Resistance bands are a great addition to any suitcase, because they allow for greater variety of exercises in a small, light package. Depending on where you stay, you may even find a tree branch that doubles as a pull-up bar on a walk! Before you begin your travels look to see if the hotel where you’re staying offers an onsite gym so you can get a quick workout in before or at the end of your day. Or, consider if there are there any parks nearby that would offer a scenic walk or jog. 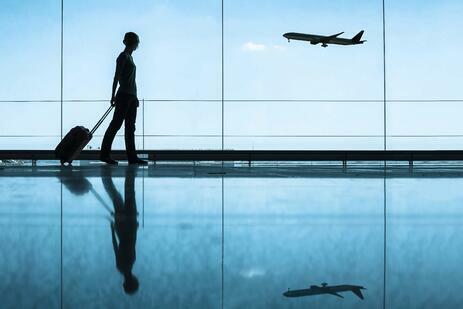 If you're flying to your destination, walk through the airport (if time allows) and skip the moving floor. So even if you don’t get in a workout or you don’t have time when you arrive, you can at least feel good about the steps you did get in for the day. Consistent physical activity is maintainable even when on the road. A big key to success is finding something that you enjoy enough to maintain despite disruptions in your normal routine. Do you hate the idea of a long walk or jog while traveling? Bring a jump-rope for a short cardio exercise that really gets your heart rate up. Don’t like push-ups or squats? Bring some resistance bands with you on your travels so you can perform a chest press, arm curls and a resisted hip extension. Hopefully, some of these ideas resonate with you and let you see that regular exercise is possible even when on the road.